With uncommon passion and devotion, High Lonesome traces the evolution of bluegrass, one of America's most vital musical fusions, from its folk roots in the Kentucky hills through the innovations which shaped its most modern forms. 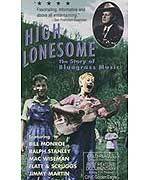 With over 100 songs and a keen thread of the cultural and historical forces running through them, High Lonesome captures the heart and soul of the music and its founder Bill Monroe, along with other seminal figures. The story unfolds through the words and songs of the musicians themselves, flawlessly matched with images imbued with an intimate front porch feel. Linking the music's birth with the social upheaval of the Great Depression and following it through the maze of American modernity, High Lonesome is more than just the vividly rendered story of bluegrass. It's a vision of how life has changed in America and a testimony to the enduring strength of a music that has continued to find voice over decades of shifting musical taste.